I’ve started to fly out of Barcelona instead of Valencia over the past year, because low-fare competition from Norwegian and Level airlines have really brought prices down on routes to and from California, on all airlines. I’m usually on morning flights out of BCN, so I’ve experimented with different ways of getting to the airport from Valencia. On one trip, I took the ALSA night bus from Valencia, leaving at 2am and arriving before 7am. That was an exhausting trip, because the bus made a couple stops along the way, with the lights turning on at one of the extended stops. (Thank goodness, on that trip I got a surprise upgrade to United Polaris business class, so I could recover from the bus journey!). But most other trips, I’ve elected to take the train to Barcelona the night before, and stay overnight, whether at an Airbnb or a hotel. My Barcelona Airbnb experiences have been hit or miss, and I find it a bit of a pain to coordinate check-in and check-out times when I really just want a place to rest after arriving from Valencia, and before an early morning departure. My hotel experiences have also been pretty hit or miss, with one hotel having just the worst noise isolation between rooms, and another having a rather odd policy of not letting guests have the key to the front door (so you had to buzz in at any hour). In short, I’d not found a hotel yet that merited a repeat booking. The Barceló hotel is actually located right on top of the Sants train station. Strangely, though, there isn’t an entrance from within the station. You have to exit (by the Lavazza café), and then make a U-Turn to re-enter the building under the “Hotel Barceló Sants” sign. The welcome mat says “Welcome on Board,” but there really aren’t a lot of signs about what to expect until you take the elevator up to the reception floor. There, you’re greeted by a space-walking astronaut! 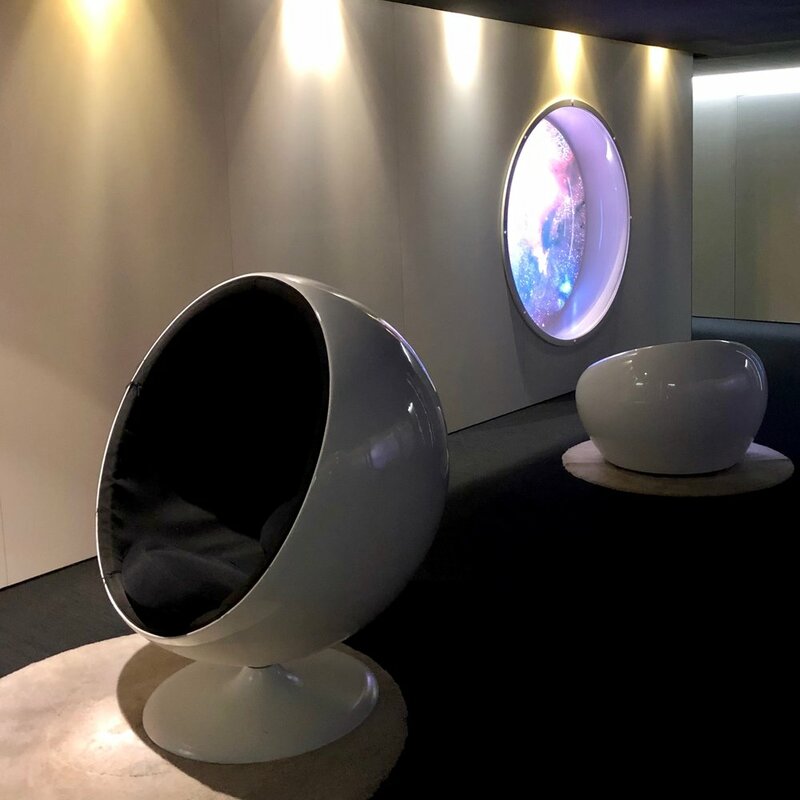 The hotel’s theme is like a 2001 Space Odyssey space station! This huge table in the lobby area looks like it could be the scene of an inter-galactic council meeting of James Bond villains. …and continues to the guest room floors. I think there are “portholes” located throughout the hotel with “views” into space? The rooms, on the other hand, are pretty normal, decor-wise. I found them highly functional, with a warm feeling due to the indirect lighting along the back of the bed and by the curtains, the white linens, and golden wood-like floors. They even provided lap-desks for working (or eating) in bed, even though there was mercifully a dedicated desk with integrated power outlets. I really despise it when hotels eliminate a proper desk. There were still hints of the galactic theme, with “portholes” in the bedroom and toilet room. Once again in Spain, there was an “open concept” bathroom where the sink was open to the bedroom. The toilet and shower were separate, but didn’t close with very isolating doors either. Since I was staying on my own, the room certainly did feel more open and airy, but I’m not sure I would like it if I were traveling with someone else. The provided amenities were from some kind of “nature-inspired” brand. Noise isolation seemed pretty good overall, though I did hear people speaking clearly in the hallway, and I was in a corner room at the end of the corridor away from the elevator, so naturally I didn’t experience a lot of noise. The bed was extremely comfortable, the rainfall shower was luxurious, and the decor calming. 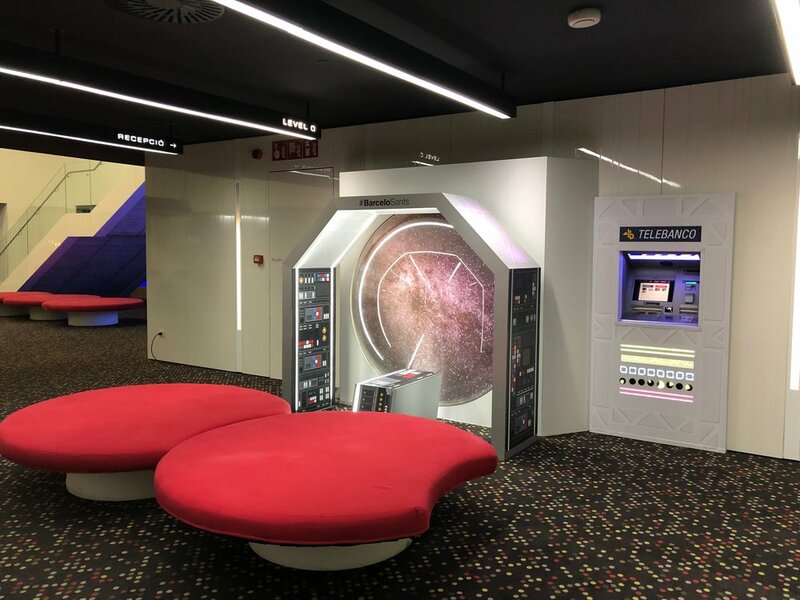 I really did enjoy my “Sants orbital experience.” And it’s a supremely practical place to stay for an overnight stay before a morning flight. I arrived at Sants the evening before from Valencia on Renfe’s Euromed service, and I departed the morning of my flight on the Rodalies commuter rail to the airport. Some logistics with getting to the airport: just note that the earliest train leaves at 5:13am, arriving at the airport at 5:30am. There is about a 7 minute walk from the train station over a skybridge to Terminal 2. If you are leaving from Terminal 1 (the terminal for most airlines), then you have to get on a shuttle bus. I’d allow about 10 minutes for that bus, because it actually gets on a highway to get to Terminal 1 - it’s really not very close. So time-wise, it’s probably about the same to go from Sants to the airport, as compared to the Aerobus from Plaza Catalunya. And the Aerobus is a bit more convenient because the first bus leaves at 5am, it goes directly to your terminal (you choose between a Terminal 1 or Terminal 2 bus at the bus stop), and they continue to roll out buses as they fill up, so there’s not a big gap between buses, unlike the train which runs only every 30 minutes.